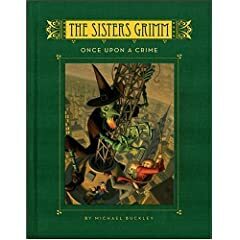 The Sisters Grimm series is wonderfully witty, full of adventure and mystery, and set in a fairy-tale community. The series is based on the idea that authors such as Hans Christian Anderson, William Shakespeare, and The Brothers Grimm, were not writing fiction – they were actually recording the history of real life magical happenings. Sabrina and Daphne Grimm (two sisters who are descendants of the Brothers Grimm) are fairy-tale detectives, and their most important case is the kidnapping of their parents. The pair live with their Grandmother, Relda Grimm, in a community of everafters (magical folk) where their neighbors are such characters as Snow White, the Three Little Pigs, and the Big Bad Wolf. As of April 2008, there are six books in the series. Once Upon A Crime is book number four in the series. In this installment the girls head to New York City where they discover a big secret about their mother, Veronica. Sabrina, the older sister, has decided that she no longer wants to be a part of the magical world. She longs to be normal. It proves difficult to separate herself from this fairy-tale detective work when a murder happens. Could the murderer be someone they know?